Life in the Pitts: The deadline has been set, KURT. The deadline has been set, KURT. "Next time you come, you should bring a baby with you." Then she stared me down. My eyes widened in surprise. "...Um, someday Grandma. But not yet." "Well, just don't wait until you are 40. I've been thinking about it, and 40 is just too old for you to start having babies." Well, I can't argue that one. "Ok. Before I'm 40. I promise." So that's it, Kurt. Your deadline is set. 14 years from now, we are having a baby. Granny sounds serious. You and Kurt better get bus-ay! You better get busy. I agree with your grandma. 40 is a bit old to start a family. Maybe 38 or something. Well, hi. I'm Helena. I grew up on a blueberry farm in Western Michigan. My days were spent reading on the beach in the summer, and reading in my bedroom under a quilt in the chilly Michigan winter. I moved out to Utah to go to school, and to get away from my family. You know, typical angsty teenager stuff. While out there, I met this guy named Kurt, who was also from Michigan. But we were just friends. Flash forward 9 years. We got married, and then we moved to Pittsburgh so he could go to Dental School. What can I say, the guy likes teeth. Now we have a little girl, a baby boy, two little turtles, and a whole new adventure ahead of us. Welcome to my life. The Day The Romance Died. Homeschooled kids are SO WEIRD. MY NEW (completely awesome) JOB!! 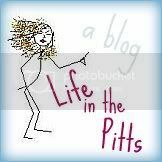 Original content published on Life in the Pitts by Helena is licensed under a Creative Commons Attribution-NonCommercial-NoDerivs 3.0 Unported License.